Leicester City’s traumatic week ended with a 1-0 win at Cardiff City although the result was never the chief concern. 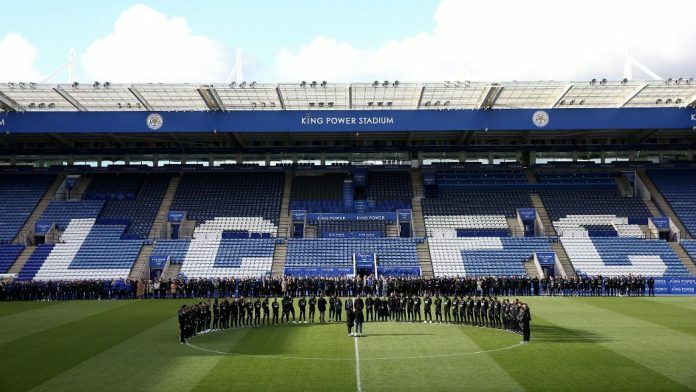 It was on a day when the tributes flowed for the Midlands club’s late owner Vichai Srivaddhanaprabha who died in a helicopter crash. Several Leicester City FC players were due to fly to Thailand later on Saturday for his funeral. A minute’s silence was held at all English Premier League grounds to mark last week’s tragedy outside Leicester City FC’s stadium in which four other people also died. TV requirements saw Saturday’s games staggered over four separate kickoff times. Liverpool moved top of the English Premier League — at least until Manchester City entertain Southampton on Sunday — after their 1-1 draw at Arsenal. Manchester United recovered to win 2-1 at Bournemouth to move seventh, while Newcastle United recorded their first league victory of the season, 1-0 over Watford. Everton and West Ham United also won. The final game of the day was arguably the most dramatic as Tottenham Hotspur almost threw away a three-goal lead against Wolverhampton Wanderers but held on to win 3-2. Most attention was inevitably focused on the Cardiff City Stadium. Tributes included a wreath brought on to the pitch before the game and the unfurling of a huge flag among the crowd in memory of the 60-year-old Thai billionaire. A second-half goal from Demarai Gray sparked jubilation amongst Leicester’s players and fans. Although, referee Lee Probert will face criticism for booking the forward after he took his shirt off in celebration to reveal a T-shirt with the words “For Khun Vichai” across the front. “I feel proud, it’s been a really tough week for everyone,” said Leicester goalkeeper Kasper Schmeichel. At the Emirates, a superb late strike from Alexandre Lacazette gave Arsenal a point after James Milner. Milner, who later broke his nose in a freak clash with team mate Joe Gomez, had given Liverpool a second-half lead. A richly-entertaining game threw up chances for both sides as Liverpool manager Juergen Klopp maintained his record of never losing to the Gunners in six encounters. Arsenal dropped to fifth after being overtaken by Spurs who climbed back into the top four after their win at Wolves. They looked comfortable leading 3-0 at Molineux after quickfire goals from Erik Lamela and Lucas Moura and then a second-half strike from Harry Kane. However, English Premier League debutant Juan Foyth gave away two penalty kicks which were converted by Wolves’ Ruben Neves and Raul Jimenez to leave Spurs clinging on until the final whistle. “I said at halftime I was the luckiest manager in the English Premier League,” said Mourinho who added that he thought Bournemouth should have been 5-2 or 6-2 up by then. The win moved Manchester United level on points with sixth-placed Bournemouth. Newcastle United fans finally had something to celebrate as Rafa Benitez’s side won at the 11th attempt after Ayoze Perez flicked home a 65th-minute header from a Ki Sung-yeung free kick. The Hammers’ deserved win was their first in the league since September and owed much to two goals from Felipe Anderson. Everton beat Brighton & Hove Albion 3-1 — their third win in four league games — with Richarlison’s double taking his tally to six goals this season.